A baby is a dancing joy of life, and the very first step to enhance these wonderfully joyous moments with your baby is to fulfil their nutritional requirements. Right after birth, a baby’s digestive system is unable to bear the burdens of a regular diet. Which is why mothers are recommended to breastfeed the newborns. However, when the baby grows, their nutritional requirements chance in accordance with their development. At this stage, just breastfeeding your baby will not be sufficient. They will soon need to start consuming solid food. Once child’s paediatrician gives you the go-ahead, you can start feeding them baby cereal. We understand that you only want the best for your baby, which is why here are some of the best baby cereals available for you. 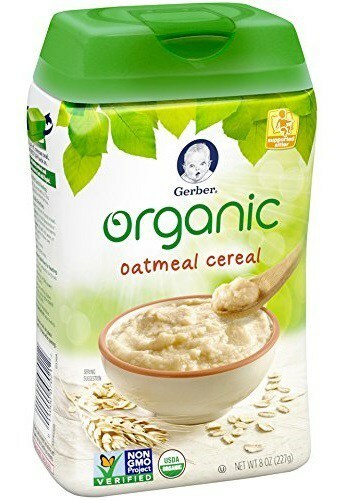 This is one of the best organic baby cereal available in the market. They are USDA certified and come in a variety of flavours for your baby to enjoy. As all the flavours are made with real fruits and vegetables, you can rest assured that your baby doesn’t eat anything adulterated. The cereals are enriched with 7 types of vitamins and minerals essential for your child’s healthy growth and development. There are also no artificial flavours and sweeteners in the cereals. The 100% BPA-free containers are handy and fit in any shelf or compartment with ease. Not only does this product come in a variety of flavours, but it also comes with essential vitamins and minerals that help in the baby’s development. The puff cereals can be enjoyed by teethers and toddlers alike, making their eating time a lot more fun and enjoyable. 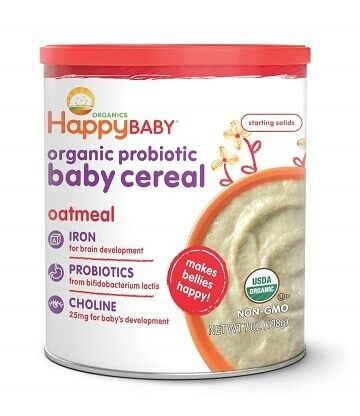 This completely organic cereal helps in easy digestion of the baby’s food. These cereals are made from a variety of fruits, vegetables, and grains, and contain essential vitamins and micronutrients for the baby’s development. The cereals are also enriched with choline to help your baby’s overall body development. The calcium in the cereal helps overcome teething issues and prevents low bone density issues in babies. The cereals can not only be mixed with water but also breast milk, formula, and other purees of other fruits and vegetables to introduce new tastes as per your baby’s food cravings. No added salt, sugar, colours, or flavours. Proper measurements need to be made manually. This organic oatmeal cereal, enriched with essential nutrients like iron, choline, vitamins, and minerals, helps in the development of the baby’s mind and body. It is certified organic, ensuring that your child only gets the best. 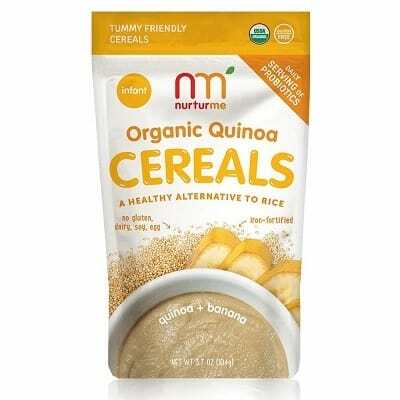 This oatmeal cereal is made from whole grain oat flour. One great feature of this cereal is that it can be introduced to babies directly, even if they were completely breastfed since birth. It doesn’t lock up the baby’s bowels and creates no discomfort. It also comes loaded with nutrients that help in the baby’s development. With just two servings in a day, the cereal makes up for almost 90% of a baby’s daily value of iron. There are also a bunch of other nutrients like vitamins C, B, A, and E, calcium, and zinc and contain no genetically engineered ingredients. You can either mix the cereal with breast milk, formula, water, or other purees to introduce new tastes to your child. It is enriched with iron, vitamins, minerals, calcium, and protein. The flat pouring spout can cause a mess if you are in a hurry. It doesn’t matter if your baby was completely dependent on breast milk, this cereal is completely safe to introduce to your baby as solid food. This cereal is made completely out of whole grains and helps your baby stay fuller for longer, especially during the night. It mixes well with milk and also any baby food like sweet potato, pumpkin, etc. for a perfect meal before bedtime. Suitable for babies between 0 to 3 years, the cereal is enriched in iron, vitamins, minerals, calcium, and protein that are essential for healthy development of your baby. The cereal is also extremely easy to prepare and can be mixed it with different ingredients like berries, banana, cheese, and butter to make a different breakfast each morning. This adds a variety of dishes to your baby’s diet, but you can also ensure that they are getting all the nutrients necessary for their growth. As the cereal comes in a carton package, you will need to transfer the contents to another airtight container once it is opened. This cereal helps deliver various nutritional requirements like iron, vitamins, minerals, calcium, and protein. The cereal is also easy to digest. 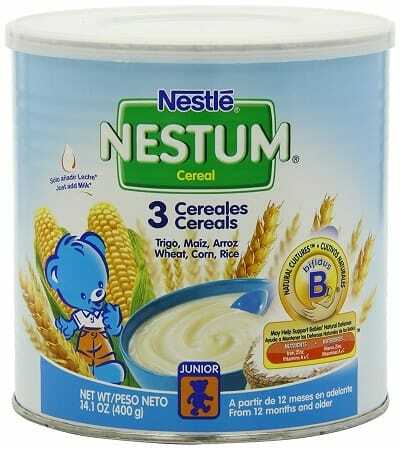 This is one of the best rice cereals available in the market for babies. Highly enriched with iron, the cereal helps in developing your baby’s brain and body. Along with iron, the cereal is also enriched in Vitamins A, B, C, and E, along with calcium and zinc. Vitamin C improves the absorption of food. Calcium builds strong bones and teeth. Vitamin A improves growth and vision and vitamin B aids proper conversion of food into energy. Vitamin E and zinc support the healthy development of your baby and also keep their immune system in check. It can be given to the baby in various forms; can be mixed with breast milk, formula, water, or other purees. Contains soy, so you will need to ensure that your baby is not allergic to soy before you feed this to them. Free from any genetically engineered ingredients, you can rest assured that your baby is getting the best of nutrition with this cereal. The banana flavour of this cereal satisfies the baby’s sweet cravings. It contains probiotics that help boost your child’s immunity and improve digestive health. It contains no dairy, soy, or egg, which means that it is extremely gentle on your baby’s delicate digestive system and ensures that it causes no discomfort. The cereal is enriched with 100% naturally occurring plant-based nutrients that support a baby’s growth. This means that the food is more easily absorbed and doesn’t lead to constipation, unlike with synthetic nutrients. As quinoa is a naturally occurring super grain, it has a nutritional profile similar to that of breastmilk, ensuring your baby is well nourished in every serve. Contains antioxidants, essential nutrients, and no additional salts, sugars and flavours, in a gluten-free cereal form. You only get about 8-9 servings per pack. 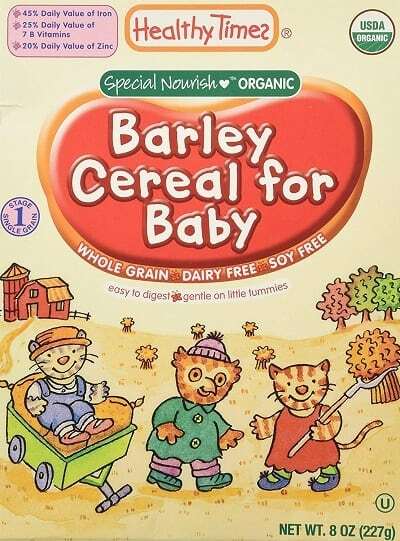 It is a gluten-free and easily digestible organic cereal for infants that is gentle to a baby’s stomach. 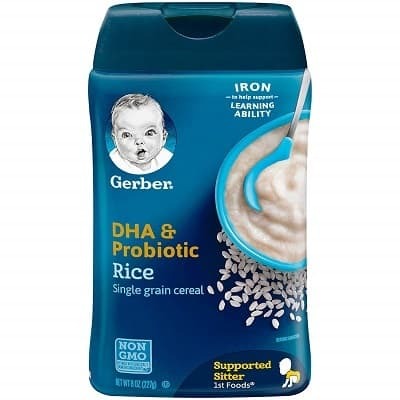 This single-grain baby cereal is made from rice and is enriched with essential DHA and probiotics necessary for proper development of your baby. DHA improve and support proper brain and eye development. Bifidus BL, a probiotic, supports healthy digestion and improves the strength of the digestive system when consumed on a regular basis. Along with this, the cereal is also enriched with other vital nutrients like iron, vitamins A, B, C, and E, zinc, and calcium. Two servings a day of this cereal can make up for almost 90% of daily value of iron, which ensures the proper development of your baby’s brain. Provides 15 servings per container. It contains fish and soy, which might not be acceptable for a vegetarian. Enriched with DHA and probiotics, the cereal ensures that your baby undergoes proper brain and eye development along with improving the digestive system and immunity. 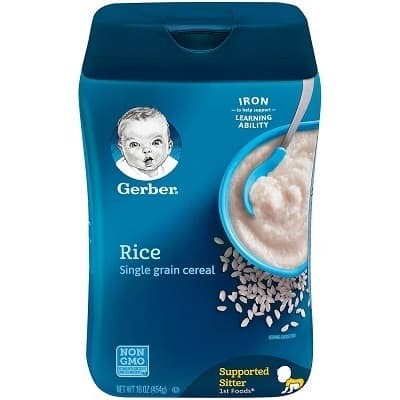 This cereal is gentle on your baby’s digestive system as it contains no dairy or soy. The cereal is USDA verified and contains no genetically engineered ingredients. A perfect blend of vitamins and minerals, the cereal provides a balanced diet for your baby. This ensures the proper overall growth of your baby. The cereal is made from organic whole grain barley flour and undergoes minimal processing to ensure that its natural nutritional value is left intact. It also adds fibre to your child’s diet, improving the strength of the digestive system. Other key nutrients in the cereal include calcium, vitamin B, zinc, and iron. No added preservatives and artificial additives. The cereal is a perfect blend of vitamins and minerals that come in an easily digestible form. Completely organic, you can rest assured that your baby is getting all the essential nutrients for their growth. With a blend of wheat, corn, and rice grains, this cereal is enriched with 10 types of vitamins and minerals. This covers up most of the daily nutritional value and makes for an essential part of a healthy weaning diet. Each serving ensures that your baby gets all the essential nutrients for healthy development. The Bifidus BL in the cereal is a probiotic and improves the baby’s immune system when consumed daily. The cereal is also enriched with vitamins A and C to strengthen the baby’s natural defence. The cereal is most suitable for babies who are 12 months old and above. Enriched with iron, zinc, and vitamins A and C.
Easy preparation; just add milk. The cereal ensures a healthy and wholesome diet with 10 essential vitamins and minerals. The simple preparation makes it easier and faster to feed the baby in case he/she is facing any discomfort due to hunger. This multigrain cereal is made from whole grain oat, rice, barley, and rye flours. With essential nutrients like iron, calcium, zinc, and vitamins A, B, C, and E, the cereal ensures that your baby consumes a healthy meal every single time. 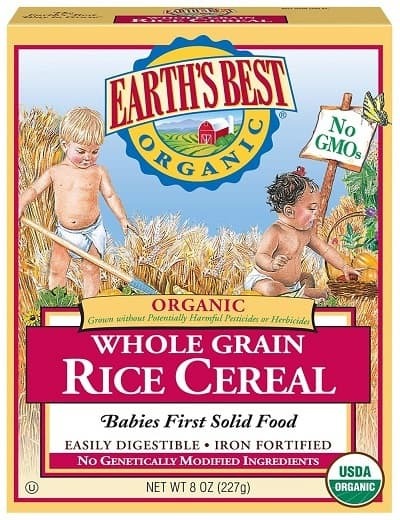 The cereal is USDA certified and contains no genetically engineered ingredients. Iron helps improve your baby’s brain development and learning abilities. Which is why just two servings can make up for 90% of daily value of iron. Along with this, calcium helps build stronger bones and teeth. Vitamin C improves the absorption of food, vitamin B effectively converts food into energy, and vitamin A improves the immunity. USDA certified and made from non-GMO ingredients. Makes up to 15 servings per container. If you’re looking for a multigrain diet for your baby, then this cereal is your perfect pick. Made from five types of grains, the cereal ensures to give your baby a wholesome and healthy meal at every serve. Babies need a plethora of nutrients like vitamins, minerals, iron, calcium, protein for healthy development. Each of the products listed above ensures that your baby gets these nutrients while making the meal time a happy and fun time. Not only are they packed with essential nutrients, but are also extremely easy to prepare. This ensures that you are able to feed the baby before he/she starts feeling discomfort due to hunger. The cereals are also travel-friendly, making it convenient for you to feed your baby even when on-the-go.